Well done and cool stuff. I'll have a closer look once solved some 70D issues. The detailed sd command states from your posted log re-activated my interest in researching sd card related stuff. 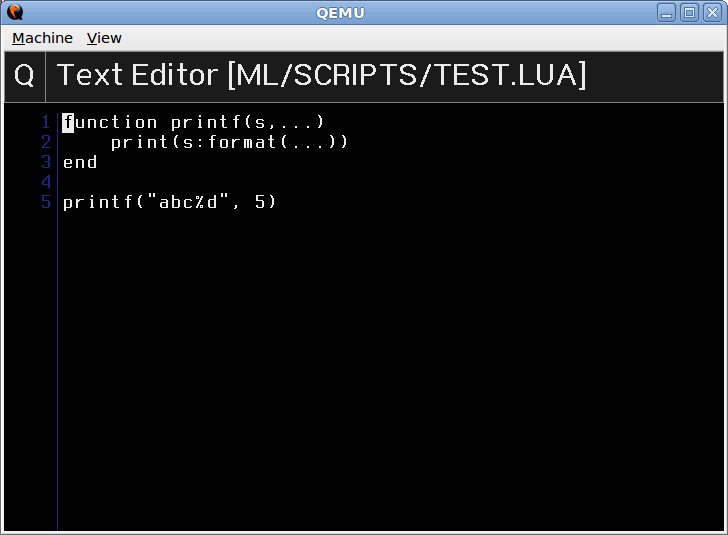 I would also like to test if I can re-produce the ML menu timeout bug now in QEMU. [GPIO] at 0xFF012604 [0xC0222004] <- 0x12 : ??? I tried to load the lua module, but nothing did appear in the menu. Anyway, the QEMU progress is impressive. Did you have any scripts? There is no menu for lua itself, scripts can create or add their own menu items wherever they see fit. You can check the console for script loading/status/errors. It seems to me that QEMU doesn't "look" for the script folder. I did run your lua module on my camera and it did work very well. How did you compile QEMU version 2.3.0? The latest in the qemu branch uses 2.3.0. Just run the install script. Is there an SPI EEPROM in 60D? The 100D firmware tries to load some properties from there and isn't happy with getting zeros. Not sure whether real data is necessary for the emulation, but it seems to be the reason why some asserts are raised. There are some "unknown spells", should I try to figure out what they do? For the 60D, are the spell responses dumped from the camera or reversed from firmware? It also complains about I2C and RTC at some points, but I don't think those are fatal errors. Somehow it crashes to a $pc=4 state which I 'm trying to track down atm, but any thoughts on what to do to make it run further would be very appreciated. May we expect an update to the qemu branch anytime soon? Sort of having issues like dmilligan encountered since you last updated qemu to 2.3. And once you read this: I would welcome the dmspy-experiments branch being merged into unified,too. Updated to run the Lua module on 60D. @nikfreak: I'm not getting this error about msg_arg1 (not even a warning), probably different cflags (I'm always (re-)installing it from contrib/qemu/install.sh script, but on an older Ubuntu). I've fixed that one anyway (it was, indeed, a bug). @nkls: unfortunately, the MPU spells are valid only for 60D for now. Yeah, the stuff in the QEMU branch expects Canon GUI to do all the display initializations (including color palette). 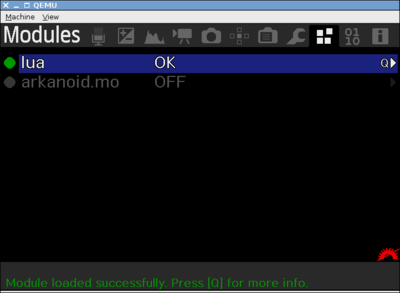 Small progress: CF card emulation appears to work on 5D2 bootloader, enough to load autoexec.bin from a CF image file. It was a while since I touched the code but I hope parts of it can be useful to someone at least. Very nice work! You seem pretty familiar with qemu internals (where I'm struggling). I'll try to integrate it with the latest branch. There is an EEPROM that you can dump with this module. I didn't use this file in my emulation though. They are taken from a startup log, from the dm-spy-experiments branch (CONFIG_DEBUG_INTERCEPT_STARTUP=y in Makefile.user), that contains calls to mpu_send/mpu_recv branch. The code is generated with this script. They are quite incomplete - just enough to boot the main dialog. I know the buttons are also sent from MPU in the same way, and it's easy to get the pattern for them. I also figured out how to decode some properties, but but most other events are still a mystery to me. guessing right that you are using IDA? Thanks guys, and thanks for the info! I was trying to to get 100D working and I guess I learned a bit about the qemu internals on the way. I wouldn't call myself an expert on the system but I know my way around bigger C/linux projects like this. I never realized the dm-spy-experiments dumped the mpu calls, I guess I have to make one of 100D when I get the time! Yeah, I'm using IDA for the decompiling and code analysis. About that serial flash though, I'm under the impression that it's only available in newer cameras (100D and 70D? ), and that it is necessary to emulate them to get to the main dialog in qemu. But correct me if I'm wrong. In 100D there are references to two flash chips PC28F128M29EWHF and K5C262GATMAF50 which are both 16MB iirc. There is a function "IsAddressSerialFlash" which is used by the property manager (or some flash access abstraction) to determine if the data is stored in flash rom (same as firmware) or serial flash rom (controlled over serial interface). I think I had it setup with DMA, interrupts and whatnot but I never made it to the main dialog. I'll give it another shot sometime but atm I'm too busy with other projects. Here are some extracts from the factory menu, note the S and V options in FACTADJ and the SIO6 menu for accessing the serial rom. Yes, experience with Linux definitely helps. I don't have that one either. I tried to run your serial flash dumper on 5D3, but the serial flash appears unused here. There are no mentions of it in the startup log, and calling SF_CreateFlash locks up. Didn't try to debug further. The 5D3 firmware has these strings: PC28F128M29EWHF and MBM29LV640EBXEI70G. There are plenty of serial flash messages on the 70D startup log, and from the errors, I think they are needed for emulation. Fortunately, the communication protocol doesn't seem too complicated. and these strings are present: PC28F128M29EWHF and 64Mt8Kx8m64Kx126b8Kx8. Quick question: when emulating the factory menu, how are you entering the input selection? As you can see there is a flag (derived from FROM) which determines what chip to install. On a second thought, those routines must be for setting up writing to main flash. The function call before "SerialFlash Initialize" is definitely for SROM though, I guess there would be some similar call in 70D but not in 5D3? Maybe the 5D3 has more space in main flash memory and thus no need for it? I think I've got most of the protocol working, take a look in this file in 100D-testing. It gets messy once you try to emulate DMA since it is shared with the SD memory transfer. is there a hidden menu option in other firmwares as well? QEMU cannot handle (passing writes to a driver) this. at least the version of 1.5 years ago wasn't able. IIRC this has to do with the fact that the ARM instruction set isn't interpreted, but somewhat translated. 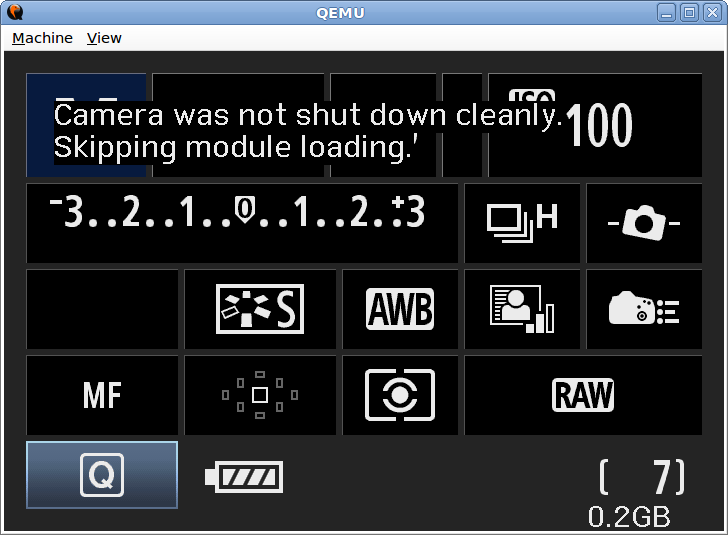 so it might be troublesome to get the whole camera hardware behave correctly using QEMU, if there is no workaround. @nkls: I think I've managed to integrate your code with my latest changes. It was a little difficult, and I'm not yet sure I did the merges right, so may I ask you to check whether it's still working fine on your side? The DebugMsg hack is pretty cool - I just managed to boot the 60D GUI with full debug messages, without any additional guest code (no autoexec.bin loaded). Didn't try the other stuff yet. I also tried to implement the DebugMsg hook with pure gdb scripting, but I got stuck because gdb wants the exact number of arguments to the format string. For example, this works for a DebugMsg call with a single % in it, but fails otherwise. Nice to see things pushed to the main repo and that you've sorted out the open ends I left in there! It seems to work and looks correct, so I think it's all good. I remember trying to get the debug messages showing through pure gdb for a while but then gave up and hacked it together in C instead. It might be possible to some extent but I bet it'll be ugly. Maybe count %-signs and branch to different cases? set *0xCF999001 = *0xCF999001triggers the IO-handle when it reads from *0xCF999001 but not when it writes to it and I can't figure out why. Not that it matters much, but it would be nice to be able to send values to qemu through a single address.